A Mediterranean inspired appetizer is sure to please any crowd! Artichokes are quite popular for their great taste and flexibility in how it can be used in all sorts of meals. They are also high in fibre which can help lower blood sugar and cholesterol levels and help prevent chronic diseases. Both the artichokes and olives (including the olive oil) are high in antioxidants which help our body fight against free radicals and ward off disease, including cancer. Antioxidants also slows the signs of aging, are great for heart health, supports the immune system and lowers risk of infections. It’s safe to say that this delicious appetizer doesn’t only pack a punch when it comes to taste, but comes with some amazing health benefits also! 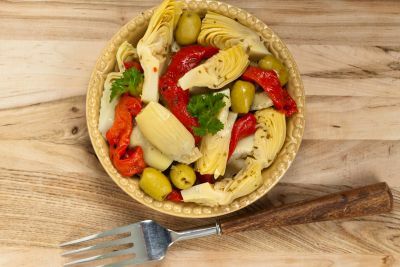 Combine artichokes, olives & peppers in a medium bowl. Blend olive oil, vinegar, lemon juice, scallions, salt & pepper in a small bowl. Check seasonings, add adjust accordingly. Add dressing to the salad mixture & toss to coat. Cover & refrigerate for a minimum of 2 hours, preferably overnight. Drain & discard the dressing. Serve salad on a platter garnished with coriander & surrounded with pita wedges. Enjoy! © 2017 Spain Gourmet Canada. All Rights Reserved.